It is the night of 29 May 1953. Inside the tent Tenzing Norgay is sharing with the New Zealander Edmund Hillary it is minus 27 degrees. The tent is pitched on a narrow and sloping rock ledge next to an 8,500 meter drop – unquestionably one of the most risky places on earth to sleep. The wind tears at the tent cloth all night. It is difficult to sleep. 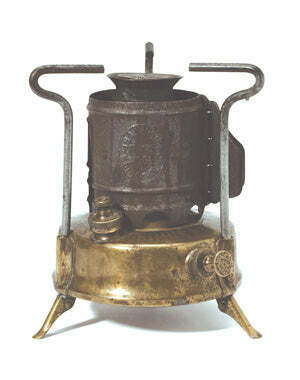 Tenzing lights the Primus stove to heat a lemon drink with sugar. Both adventurers know that the minimal amount of oxygen in the air causes the body to breathe faster and urinate more. This increased respiration and urination mean additional water loss and these lost fluids need to be replaced by drinking more. Not drinking enough will result in death. At six thirty in the morning, the men set off to grapple with the mountain. The peak is already bathed in sunlight but is dark,cold and windy at lower altitudes. At certain points, the snow is so deep theysink up to their shoulders on each step forwards. And the struggle against the snow and the steep mountain is soon felt in the oxygen thin environment. Hillary, renowned for his positive outlook on life, asks his partner if it is worth continuing. "We do as you wish," Tenzing replies. Hours pass and the snow conditions only get worse. But there is no alternative route in sight. In front of them awaits a final trial of strength, a twelve meter high rock face covered in ice. 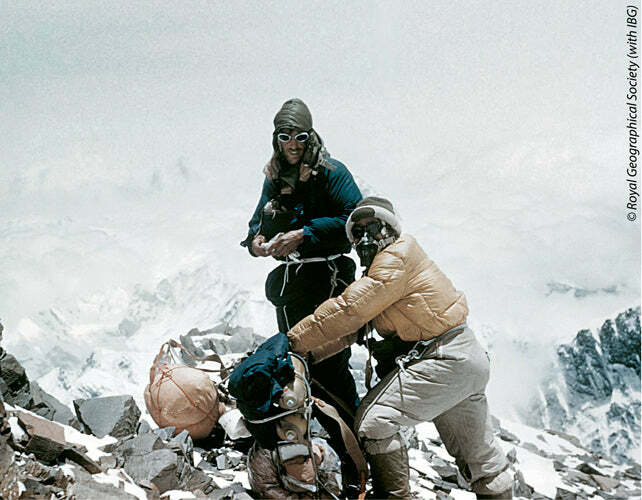 Hillary climbs first, carving a path with his ice pick and helping Tenzing up onto the mountain ridge. The two men appreciate that they have climbed higher than anyone else before them and that the summit is within reach. In front of them await treacherous drops on both sides. But visibility is good and they force their way forward. A couple of blows with the ice pick and they have reached their goal: The roof of the world. A polite handshake is rapidly transformed into broad smiles and backslapping. Hillary takes a photograph of Tenzing holding the flags of Britain, the UN, Nepal and India. In the snow, they plant a crucifix and several gifts to the gods before starting the equally dangerous descent to their base camp. As we all know, their adventure ended in triumph and Sherpa Tenzing Norgay became a national hero and unofficial ambassador for an entire people, with the world as his workplace. Edmund Hillary was knighted and returned to Nepal time after time where he founded the Himalayan Trust. Schools, hospitals, an airport and a national park around Mount Everest are all the fruits of the Trust's continuing work – a work that both Hillary and Tenzing considered to be their most important deeds in life. Even though they only spent fifteen minutes at the summit, their inheritance lives on as an inspiration to the whole of humanity. The adventurous spirit that drives the work we do at Primus, cannot be better summarized than in the words spoken by Sir Edmund Hillary about their feat: "While standing on top of Everest, I looked across the valley, towards the other great peak, Makalu, and mentally worked out a route about how it could be climbed… It showed me that, even though I was standing on top of the world, it wasn't the end of everything for me, by any means. I was still looking beyond to other interesting challenges." 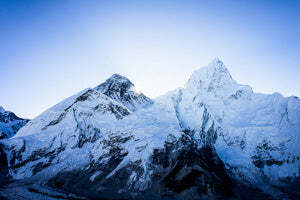 Why the name Mount Everest? 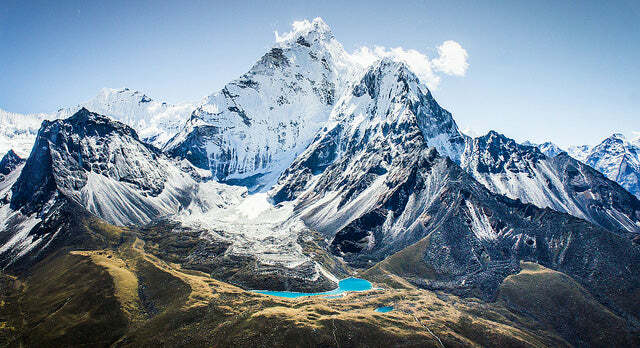 In 1852 the Indian mathematician Radhanath Sikdar calculated the exact height of the world's highest mountain. The then British army Major General Andrew Waugh, Surveyor-General of India, decided to name the mountain after his predecessor, George Everest, who surveyed the Indian sub-continent in the half of the 19th Century. Ironically enough, Everest himself preferred to keep the local name. 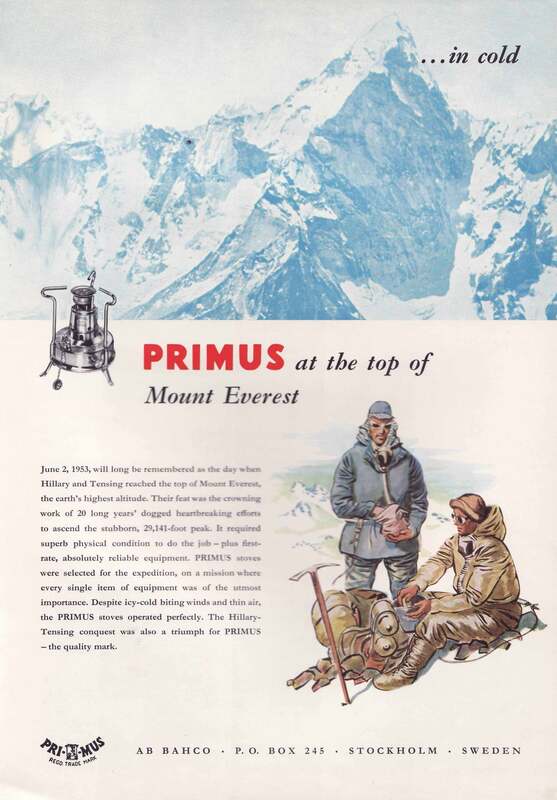 The British expedition to Mount Everest in 1953, of which Hillary and Tenzing were members, used both outdoor stoves and lanterns from Primus. Although both these adventurers have now passed away, their inheritance lives on, above all via the Trust founded by Hillary. For more information on how you can contribute to the Himalayan Trust and their charitable work, go to www.himalayantrust.co.nz.